This product requires the base game Dead by Daylight. Daughter of a famous actress whom she had never met, Jane was raised by her father, a struggling visual artist. Her parents had separated when she was still a baby. Growing up, she sought to emulate her mother's powerful on-screen presence. She built herself from the ground up, auditioning for commercials, leading radio-interviews, and guest-starring in variety shows. Her authentic delivery and sharp ad-libs, however, cost her dearly. While she encountered failures along the way, she kept believing in her skills, and eventually got the opportunity to co-host a failing talk show. Live television meant long hours, a low salary, and no stability, but it also offered her a platform to broadcast her own values. She used the show to connect with her audience and deliver genuine material, often discussing her personal issues, gathering a loyal audience that broke records. Her success also generated an increasingly demanding schedule, which she managed all by herself. The growing pressure began to smother her self-confidence and one day she snapped, delivering a catastrophic live interview. That evening, she was driving to her father's house when she closed her eyes to rest, and opened them moments later, in the realm of The Entity. Jane's personal perks, Solidarity, Head On, and Poise allow her to support other Survivors, defend herself, and avoid leaving a trail for the Killer to follow. 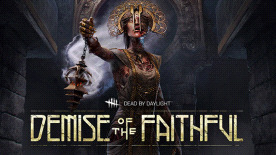 The Demise of the Faithful Chapter includes an exclusive item for Jane, her Floral Shirt, only available as part of the DLC. Please note that this item cannot be purchased separately. The half-forgotten, temple complex dedicated to the cleansing of the High Priestess's followers. The vertiginous hypostyle hall was believed to hold the weight of the heavens. Stolen from the memories of The Plague, the temple was planted in the howling Red Forest, whose winds eroded its smooth edges. It now stands as a beacon of fear, visible from all cardinal points. With these requirements, it is recommended that the game is played on Low quality settings.